PDP was established in Banja Luka on 26 September 1999. 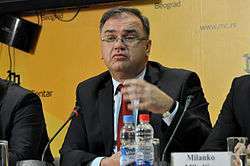 During the founding assembly, Mladen Ivanić was elected as the president of the party, while Branko Dokić and Zoran Đerić were elected as vice presidents. The party is an observer member of the European People's Party (EPP) and International Democrat Union (IDU). In terms of bilateral cooperation with other European parties, PDP maintains strong links with the Conservative Party (UK), Moderate Party (Sweden), Christian Democratic Union (Germany), SDKU (Slovakia), Austrian People's Party, New Democracy (Greece) and Democratic Party of Serbia and G17 Plus from Serbia. PDP also has good relations with Konrad Adenauer Foundation, Robert Schuman Institute and Democrat Youth Community of Europe. 1 2 Wolfram Nordsieck. "Bosnia and Herzegovina". Parties and Elections in Europe. Retrieved 19 April 2015.